I’ve always have done a fair amount of tracking as part of my job as a finishing artist. However, there have been shots that I haven’t been able to nail, even with the tracker in Autodesk Smoke. Many times I’ve come up against shots that I couldn’t do or had to hand track to get that last bit to work. Recently, I was lucky enough to give Mocha Pro a whirl, and all that struggling with problematic tracks is over! Tracking is a huge part of visual effects — from simple fix-it shots, like sign replacements, to bigger tasks like adding and integrating 3D characters and objects. If a track is bad, it’s impossible to make a convincing shot. You’ll notice this immediately when a CG character floats above the ground or a sign replacement bounces around not sticking to where it is supposed to stick. Most apps have built-in point trackers: Adobe After Effects, Avid DS, The Foundry’s Nuke, and Autodesk’s Flame and Smoke. Point trackers look for a specific point to follow within an area defined by a tracking region. 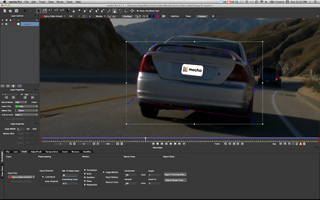 Mocha Pro uses what’s known as a planar tracker. The planar tracker in Mocha looks for planes and analyzes textures inside the region defined by the spline shape. Planar tracking technology was invented by Imagineer Systems co-founders Dr. Philip McLauchlan and Allan Jaenicke in 2001. It has a long and successful history being used on big features, such as The Hobbit, The Amazing Spider Man and the Harry Potter series. In fact, the technology in Mocha was recognized by the Academy of Motion Pictures Arts and Sciences with a Scientific and Technical Award in 2012. Rather than spend a lot of time describing the product in great detail, which you can find on the Imagineer Website via many videos, I’ll detail my impressions after working on a couple of shots. I will say getting up to speed is a breeze with the logically-arranged GUI — all the commonly-used tools are readily accessible in a task bar across the top of the interface, and the lower portion of the GUI is tabbed, which allows users to quickly move between tasks when working on shots. I shot the test footage on my trusty Panasonic GH-2 on a bicycle handlebar mount with the camera inverted and without any stabilization. The shots are challenging to track because of the road vibration and the change in perspective as I’m flying down the road. Mocha imports most types of footage, but unfortunately not AVC-HD from the GH-2. So I created a new project in Premiere Pro and loaded the native footage, inverted the footage, found the shot I wanted to track, right-clicked on it and loaded the first shot into After Effects, which loaded the footage without issue. But to get the shot into Mocha, I quickly rendered it out in ProRes HQ and layered that back on top of the AVC-HD in the After Effects comp. I then loaded the ProRes clip into Mocha for tracking. Even with the uneven road, the in and out of the autofocus and the twisting of the bike and car, the track was like magic! It made what would have been impossible possible. I then exported two different tracks. The corner pin for the license plate and then a track to make the text follow the car as it wound its way downhill. The coolest thing about the whole process is how easy it all is. Load the clip, work the track, copy and paste the data from Mocha to AE, then save the After Effects Project and, with dynamic link, it updates in Premiere. The second shot I did was to test the workflow between Mocha and Smoke 2013. 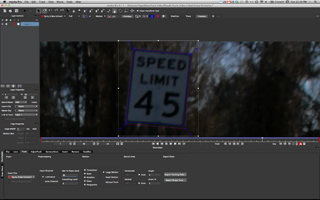 It’s a type of shot that can be very time consuming: a sign replacement with the sign moving off screen during the shot. In Smoke, each corner point is tied to a point tracker, which often has to be massaged to work, and then tied to an offset track as the target object moves off-screen. In Mocha, I just drew a simple x-spline around the sign and hit track. Mocha nailed it on the first go. I adjusted the edges of the plane to where my replacement sign was going, made sure that it stuck throughout the range of the track, then exported the data in the format for Flame/Smoke/Flare. 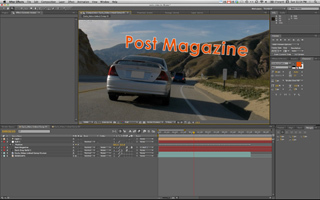 Mocha can export data to most places it needs to go — Nuke, After Effects, Flame, Motion, Shake and FCP 7. It even comes as a standard feature in Quantel’s V.5 software. Back in Smoke, I added a ConnectFX effect pipeline to my shot, loaded an Action node, Smoke’s 3D compositing environment, loaded the replacement sign I created in Photoshop, changed the layer to a bilinear, loaded the exported tracking data from Mocha into each of the four corners of the bilinear shape, and it stuck it. One small gripe I have is the non-standard frame advance keys. Most programs use the arrow keys to move frame forward/back. In Mocha, it’s Command (Mac)/Control(Win) plus the arrow keys. However, this can be changed in the keyboard shortcut tab in Mocha’s preferences. Mocha is great for these types of quick fixes, but it has even more under the hood. It does magic with stabilization, creating clean plates, helps automate roto by attaching roto shapes to the planar tracks, and in V.3 they introduced a 3D camera solver for After Effects and FBX. Mocha Pro now also features lens distortion/rectification tools. I will add Mocha to my bag of tricks! Barry Goch (barry.goch@gmail.com) is a DI Editor at Modern VideoFilm(www.mvfinc.com) in Santa Monica.